Sprays 35 feet, the farthest of any bear spray. Made by Sabre, a name you can trust in pepper spray since 1970. Top Notch formula with 2.0% Capsaicin and related capsaicinoids, twice the level required by the EPA to be called "bear spray". 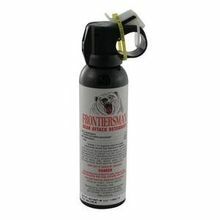 The hottest bear spray made anywhere by anybody. This is the number one reason why you should protect yourself and your family with Frontiersman Bear Spray when enjoying the great outdoors! According to a study by the University of Utah, pepper spray will fail 30% due to weak batches. 30% failures can result in serious injury. SABRE, manufacturer of Frontiersman Bear Spray, is the only brand which eliminates these failures due to weak batches by operating an exclusive in-house HPLC laboratory. SABRE products are also supported by the prestigious ISO 9001:2008 Certification as an added means of guaranteeing the highest production quality. Have your bear spray ready, of course. You DO have bear spray, of course. Being in bear country without it is irresponsible. Bear pepper spray cannot be shipped to APO addresses, AK or HI. Cannot be shipped by air.